14487 Comments - Leave a comment! Today MD from Studenomics and I are debating a hot button personal finance topic: Should you pay for your kids’ college education. He takes the stand that you shouldn’t while I am stepping up to the plate for those that believe you should. Be sure to check out his article HERE and let us know what you think. I make no qualms about it. I was incredibly fortunate and walked away with a private school education and a master’s degree from a top-10 program in its field with only $18,000 in student loans. The majority of my college was paid for my father with his Amex (if you weren’t aware, if you pay for a college education on your credit card, you are likely to earn enough reward points to get a 50 inch flat panel when all is said and done). Now, contrary to what you are going to read, I actually believe with MD over at Studenomics on why a kid should pay for his or her own college expenses. But, where is the fun in a debate without at least one-person playing devil’s advocate. Read on to see why parents, kids and both parties benefit from paying for a child’s college expenses. There is some incredible savings that can be had by setting up a 529 plan for your kids’ education. While there may be some state deductions you can take for contributing to a 529, there are no federal deductions. However, that doesn’t mean this plan isn’t the shiz. If you put money into a 529, it will grow tax-deferred. When you go to withdraw funds, it will be free of federal taxes. That is some serious savings. Considering there are no income limits in order to contribute and the contribution limit in most states greatly exceeds $300,000, this is one of the best vehicles to invest. Oh, and for the control freak parents out there (read the next paragraph too), the money inside of a 529 doesn’t ever leave the donor’s control. If for some reason you would rather not give the contents of the 529 to your kid, you don’t have to. It’s not their money, it’s yours. 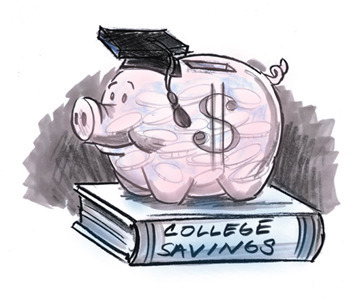 To go along with the money remaining under your control, the obvious benefit of paying for your kids college is that you now have a say in their decision. I am not suggesting you hold this over your kids’ head. But if you feel they need to work hard for grades in high school or they need to apply for scholarships to help offset some of the costs, you have the means to persuade them. However, I do urge you not to limit their school choice or their choice of study (being a Jewish kid, the old joke was, “what’s your major? Law or medicine?”). Let them be an individual, but you do have some say in how they reach the end goal by using your means. The benefits for paying for your kids’ education greatly favor the children, but that shouldn’t be a surprise. There are two major benefits that will make a difference in your children’s life if you pay for their education. The first benefit is that they will be able to focus on more things than just making money while in college. That means they will be able to spend more time studying, more time looking for quality internships (even if they are unpaid) and more time partying. Yes, partying – on your dime! The relationships that people foster in college last a lifetime and help to build a social network and framework for their careers. You should be proud to have your kids be partying with your money, as these types of relationships will make them far more successful than the average college course. The second benefit is giving your kids a fresh start upon completion of college. Instead of feeling weighed down by a mountain of debt they will be free to go after their dreams. There are enough examples of personal finance bloggers that feel bogged down by student loans and end up taking a 9-5 job they can’t stand because they feel the pressure to pay down their debt. Us readers can empathize with them. If you have the means to aid your kids, this may be the greatest benefit of all. There are some additional benefits to paying for your kids’ college for both parties. Primarily, after college you can get rid of your kids and they can get rid of you. You paid for college, therefore if they hold up to their end of the bargain, they should be able to find work at go out and start their lives. Economically speaking it makes sense as well. Making best use of your money and your kids’ money, using a 529 saves you from capital gains tax as well as saving your kids from having to pay interest on loans they would otherwise have to take out. Thanks for reading my side of this debate. Be sure to check out the flipside over at Studenomics and let us know what you think by leaving a comment. After study a few of the blog posts for your web site now, and i also genuinely as if your method of blogging. I bookmarked it to my bookmark site list and will also be checking back soon. Pls check out my web page also and tell me what you consider. on the other hand notion this informative article has been fantastic. discover actually ?? Many thanks! Itˇs really a nice and useful piece of info. Iˇm satisfied that you just shared this helpful info with us. Please keep us informed like this. Thank you for sharing. as i wish for enjoyment, since this this website conations truly fastidious funny stuff too. important. More people have to look at this and understand this side of your story. I was surprised that you aren’t more popular because you surely have the gift. Aw, i thought this was a really nice post. In concept I have to devote writing such as this moreover – spending time and actual effort to produce a really good article… but so what can I say… I procrastinate alot and also by no means often go done. detailed about my trouble. You’re wonderful! There is noticeably a lot of money comprehend this. I suppose you抳e made particular nice points in functions also. To be sure completely along with your conclusions and imagine that you抳e made some excellent points. Also, I prefer customized for specific cultures of this site and also the easy navigation. I抳e bookmarked your site and may return often! list and will be checking back soon. Take a look at my website too and tell me what you think. There are definitely a whole lot of details like that to take into consideration. That could be a nice level to deliver up. I supply the thoughts above as normal inspiration however clearly there are questions just like the one you bring up the place crucial thing shall be working in honest good faith. I don?t know if greatest practices have emerged around issues like that, but I抦 sure that your job is clearly recognized as a good game. Each girls and boys really feel the affect of just a moment抯 pleasure, for the rest of their lives.